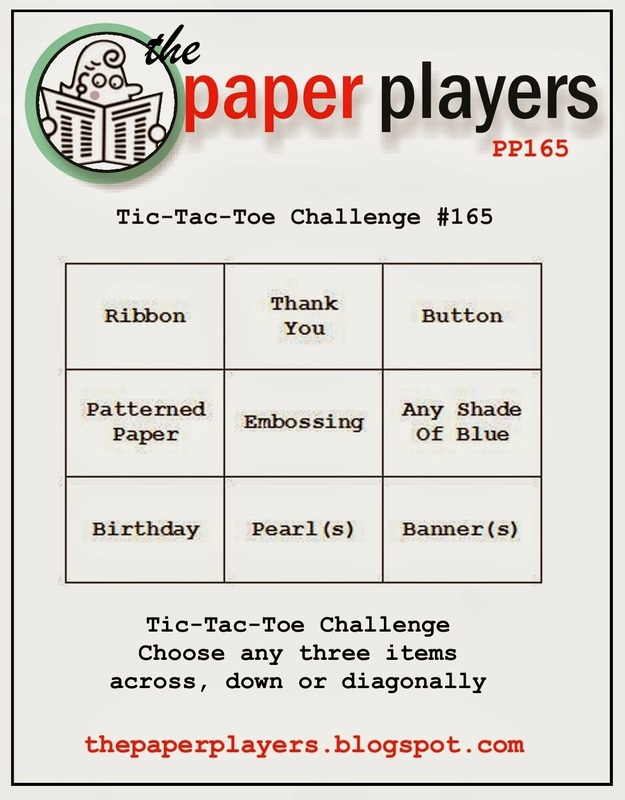 The Paper Players have devised a fun little challenge this week in the form of a tic tac toe. What do you know about Tic Tac Toe? Did you know that it was very popular in Ancient Rome, called Terni Lapilli? Some have even traced the same game back to Ancient Egypt. 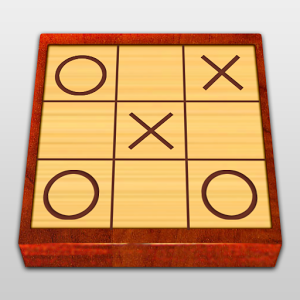 The British name for it is Noughts and Crosses, and it was changed to Tic Tac Toe in the US in the 20th century. It was also the first computer game. Whatever the name, it's fun for awhile until both opponents figure out the winning schemes and then the game always ends up in a draw!! This is an emboss resist technique. I stamped the background stamp, En Francais, in Crumb Cake ink on the panel, then sponged the whole paper with Crushed Curry, Pumpkin Pie, Real Red Cajun Craze and Old Olive. I used the solid images from Gently Falling stamped in VersaMark ink to add clear embossing powder to and heat embossed the leaf shapes. I then sponged over the leaves and the rest of the panel with Soft Suede, to bring out the leaf shapes. The ink won't stick to the clear embossing. The label and sentiment are from Harvest of Thanks, stamped in Cajun Craze and die cut using the Apothecary Accents Framelits. It's mounted on a combination of Pumpkin Pie Chevron Ribbon and Burlap Ribbon. Finally I added some Pearl Basic Jewels to complete the requirements of the Tic Tac Toe. You can do a bit more collage stamping before adding the embossed images, but I opted to keep it simpler. I like how it turned out. Hope you do, too! Heather your card is just gorgeous! Love the background you created with the emboss resist technique. 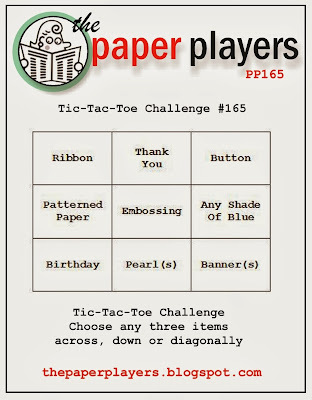 Thanks for playing with us this week at The Paper Players!